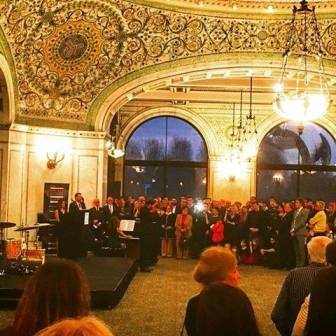 The 10th Anniversary Celebration of Chicago-Belgrade Sister Cities Partnership was held at the Preston Bradley Hall of the Chicago Cultural Center. The organizers of the celebration were Chicago Sister Cities International and Belgrade Committee. Desko Nikitovic and Ljubisa Milicic, Co-Chairmen of the Belgrade Committee, addressed the audience. Co-Chair Nikitović recalled the signing of the Charter of the two sister cities, as well as the activities carried out in the past. He also announced the engagement of the Belgrade Committee on new projects, especially on those that will contribute to the intensification of economic cooperation between the two cities. On behalf of the City of Chicago Lisa Kohnke, Director of Strategic Partnerships and Global Affairs in the Office of the Mayor read a welcome letter from the Mayor of Chicago Rahm Emanuel. In his speech Acting Consul General Dejan Radulovic stressed the importance of strengthening the sister cities relations between Belgrade and Chicago and also thanked the organization Chicago Sister Cities International and the Belgrade Committee for organizing the celebration. Acting Consul General then read a letter from Belgrade Mayor Siniša Mali which was sent on the occasion of the celebration. Participating in the program were violinist Stefan Milenkovic, folk ensemble "Božur", Serbian choir "Branko Radičević" and Goran Ivanovic Trio. MC of the program was Tanja Babic, journalist and speaker of the morning TV program ABC7. Exhibited at the Preston Bradley Hall were artworks of painter Gordana Nenadović. Gallery of photos from the celebration can be found here.